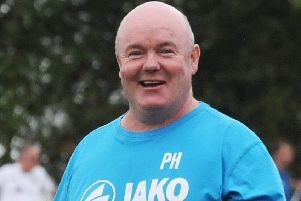 Brakes recovered from conceding an early penalty to record their fifth successive victory in all competitions as a second-half goal glut saw off the spirited challenge of Midland League Lye Town, writes Paul Edwards. Progression in a cup competition for the second time in four days has rounded off a very productive month for Leamington and ensures there is still plenty to look forward to, with some attractive fixtures ahead in December. Paul Holleran had promised changes for this game and he was true to his word, resting Jamie Hood and Connor Gudger, while dropping Jack Edwards and Junior English to the bench. Goalkeeper Ben Newey was also in the squad for the first time and came on for his debut in the closing stages. Jack Till curled the first attempt of the game into the arms of Tony Breeden in the opening minutes, Ahmed Obeng giving Matt Sargent his first test of the evening at the other end when he did well to keep the ball in play on the touchline before driving a shot in at the near post which the keeper pushed behind. Luke Paskin appeared fortunate to escape with a ticking off from referee Simon Brown after holding back Anthony Dwyer as he tried to run through on goal. Reece Flanagan took the resulting free-kick, the ball deflecting on to the roof of the net. Colby Bishop then did well to nod a right-wing cross back into the centre, Dwyer nudging the ball back for Ahmed Obeng whose shot was well blocked. The majority of the sparse crowd were then stunned as the visitors were awarded a penalty just past the half-hour, James Bowen penalised for a shirt pull. Joe Lawley stepped up to calmly send Breeden the wrong way from the spot. Brakes restored parity within four minutes courtesy of Connor Taylor’s first goal for the club, the midfield man latching on to a good pass from Dwyer to drill a low effort past Sargent and into the net. Leamington stepped up the pace in the second half, Reece Flanagan dancing past a couple of challenges on the edge of the box before crashing in a fierce strike that Sargent beat away to the edge of the box, Obeng’s first-time effort travelling just the wrong side of the upright. Eight minutes in, the second goal arrived as Lye failed to clear their lines with efforts raining in. 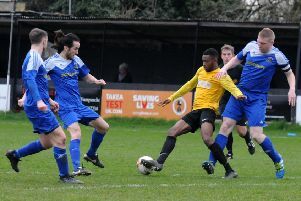 Bishop had a well-struck first-time volley blocked and Obeng was denied as he attempted to head in the loose ball. It was eventually played back in from the right by Dwyer who fired it into the centre under heavy pressure, Obeng merely having to direct the ball into the net as it struck his chest. Bishop was a whisker away from a third when he beat two defenders on the left edge of the box before curling a shot just over, while Dwyer’s turn and shot resulted in a corner. Paskin eventually found his way into the referee’s notebook for impeding Obeng as he looked to burst forward. Brakes’ forward momentum continued, however, Bowen leathering in a shot that deflected behind. A quick break forward saw Taylor feed Bishop on the right and though the angle was tight his powerful shot grazed the top of the bar. Sargent was then required to fist away another effort from Dwyer. Gloss was applied to the scoreline with three goals in the final 15 minutes, Bishop finally getting on the scoresheet when Bowen laid the ball on a plate for him two yards out. Five minutes later the striker had a second. Played up to the edge of the box on the right by a superb pass from the impressive Taylor, who nutmegged his marker in the process, Bishop still had plenty to do but stepped past a defender and smashed in a shot that found its way into the net at the near post off the unfortunate Sargent. The ‘old five’ was complete with four minutes to play when great work from Kieran Dunbar saw him slide the ball into the centre from the left. Obeng and Lye’s Joe Colley both slid in and the ball ended up in the back of the net to complete a satisfactory night’s work for Leamington. Brakes: Tony Breeden, (Ben Newey, 82), Kieran Dunbar, James Bowen, Joe Clarke, James Mace, Jack Lane, Connor Taylor, Reece Flanagan, Colby Bishop, Anthony Dwyer, Ahmed Obeng (Tom James, 86). Subs not used: Jack Edwards, Junior English, Callum Gittings. Lye Town: Matt Sargent, Joe Colley, Lewis Probert, Adam Meacham, Luke Paskin, Jack Pearlman, Ashley Parson-Smith, Joe Lawley, Josh McKenzie (Dreniz Bala, 81), Ben Billingham, Jack Till. Subs not used: Luke Carter, Aaron Bishop, Lewis Clarke, Lewis Worsey.